Here you will find an ever-changing selection of the clay pipes that I have designed and made, many of them based on originals. Over the years I have produced for Smokers, Collectors, Re-enactors, Movies, TV and Theatre. Each pipe I make is carefully formed and hand finished giving you a finely crafted product. My aim has always been to provide pipes that will be admired and enjoyed - even destined to become sought-after antiques of the future! Some are inspired by old pieces in my collection and I often try to emulate the elegance and quirks that those display. Do browse my inventory and if you need more help then do ask. You may order and pay immediately through the shopping basket system provided. Remember that my stock changes throughout the year so do come back for another visit soon. Thank You. This Web Page is up to date as of April 24 2018. If it is not shown here then I do not have it in stock. I am unsure when I will be making more pipes. We always acknowledge WWW orders by email within one working day -- if you don't hear from us within that time, please email us. Pipe prices shown exclude Post & Packing, which is added to your order based upon where you want the pipe delivered (UK, Europe or Worldwide). Our P&P charges are based on what it actually costs us, and are worked out as a starting value, charged for the first pipe you select, plus a small increment for each additional pipe added to your basket. That means, of course, that you can save on Post & Packing costs by buying several pipes at once. 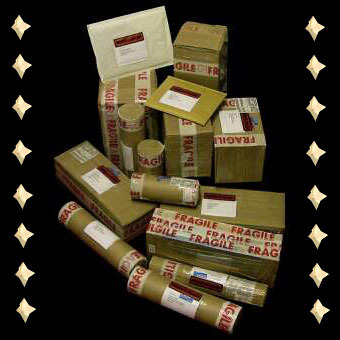 All orders to UK destinations are sent by a fully tracked courier service, which typically takes 3 working days. Those to non-UK destinations are normally sent by standard Airmail. We can provide different delivery services (such as Tracked-and-Signed Airmail or International Courier delivery) subject to additional cost; if you require such a service then please contact us to discuss your requirements: service availability and cost varies by destination country and size of order, so we are unable to offer a standardised menu of these more specialised delivery services. I created this pipe a few months ago with the bowl in the form of a wolf head. It took several days to complete. This is a totally unique, one-off creation and I have not made another like it and not likely to again. All hand modelled and carved from white clay, hand burnished smooth surface. The mouth tip is treated with white fired-on glaze. The face features and neck are treated with glazes including some metallic bronze lustre. When smoked the bowl colour will darken and the glazed features will stand out more adding to the overall wow appearance! This is a pipe that will really make you howl! I hope it will be enjoyed for many years. 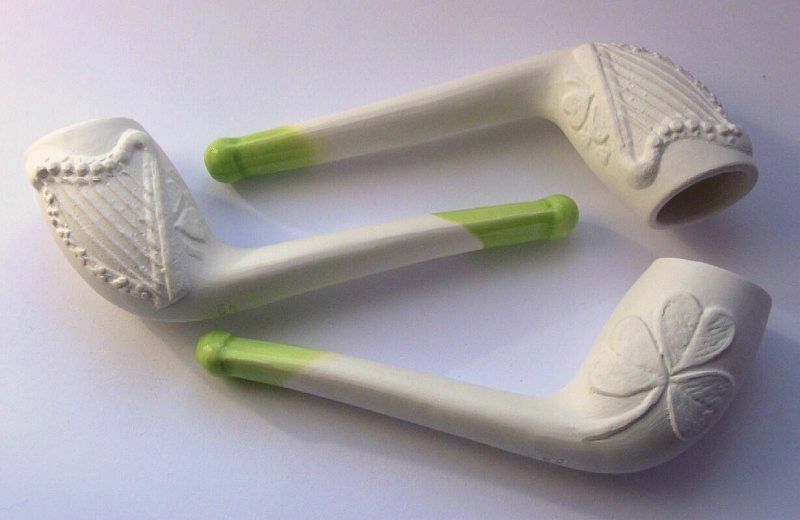 This is my version of a traditional Irish clay pipe. The design has a harp on one side with shamrock on the other. The style of pipe is similar to original 19th Century pieces and has a short stem - a real nose warmer! Also a good-sized bowl. A perfect pipe as a gift or for your own use. This design takes us back to the time period of c.1865-1930 and is similar to original pieces. I have taken a traditional mariner's theme with a sailing ship and an anchor. It has a good sized bowl and a short stem - a real nose warmer! A perfect pipe as a gift or for your own use and ideal if you have a boat or like to sit by the coast. Send me a picture of you with this pipe on the sea! Something NEW from Dawnmist Studio for 2019! For those who want to give up smoking but like to have something in the mouth. I have designed and made these clay tubes which are similar in size to large cigarettes. You pop one in your mouth and just draw some of that good Oxygen O2 while you are going about your work or leisure. I can not promise this will help you to stop smoking but they might satisfy the craving a little. You get TWO O2 Sucker's in this purchase. Specially formed metal wire for dealing with blockages which might occur in your pipe stem due to the build up of sticky resin. This wire will work for any pipes up to 12 inches in length. 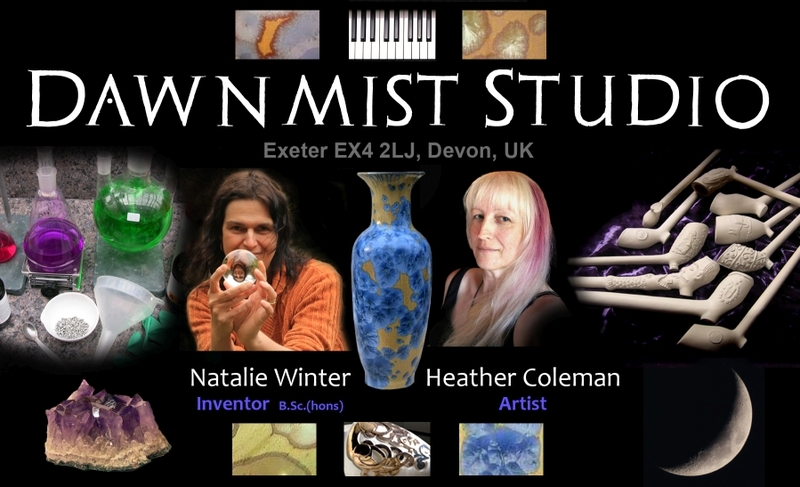 It is made to suit my own Dawnmist Studio products which have a bore size of 2mm or more. It might work for other clay pipes you have if the hole is large enough. The wire is 1mm diameter iron with a grip at one end and shaped edge at the other. It will also bend to suit curved pipes! Push the wire carefully into the clay pipe stem until the obstruction is reached twisting to gradually slice through the sticky tar, then push up and down to remove the waste material. If your clay pipe is longer than 12 inches I can make them up to the right length, just let me know. Note the price of postage works out more economical when purchased with a clay pipe rather than on its own. Price is for one wire. Specially formed metal wire for dealing with blockages which might occur in your pipe stem due to the build up of sticky resin. This wire will work for any pipes up to 9 inches in length. It is made to suit my own Dawnmist Studio products which have a bore size of 2mm or more. 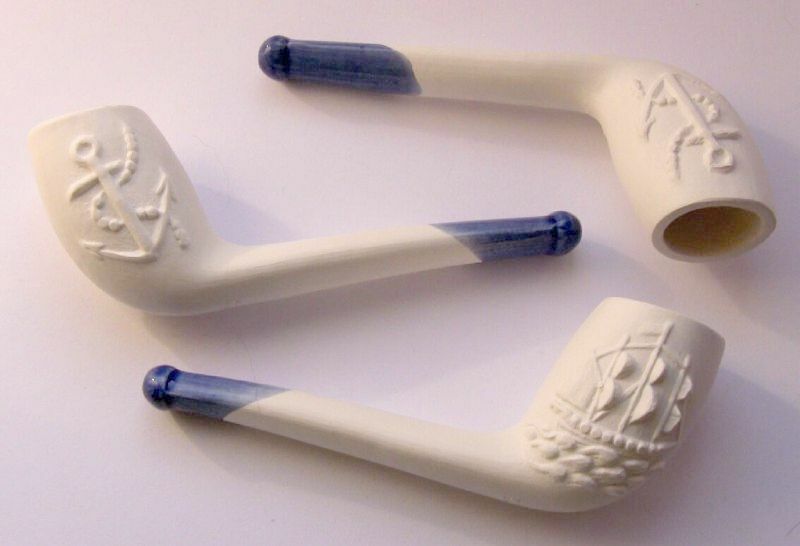 It might work for other clay pipes you have if the hole is large enough. The wire is 1mm diameter iron with a grip at one end and shaped edge at the other. It will also bend to suit curved pipes! Specially formed metal wire for dealing with blockages which might occur in your pipe stem due to the build up of sticky resin. 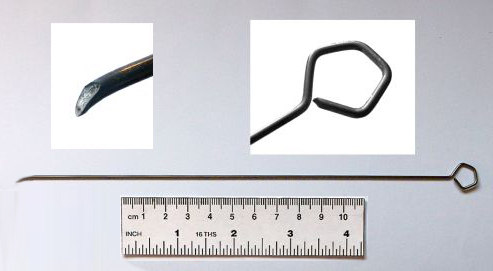 This wire will work for any pipes up to 6 inches in length. It is made to suit my own Dawnmist Studio products which have a bore size of 2mm or more. It might work for other clay pipes you have if the hole is large enough. The wire is 1mm diameter iron with a grip at one end and shaped edge at the other. It will also bend to suit curved pipes! 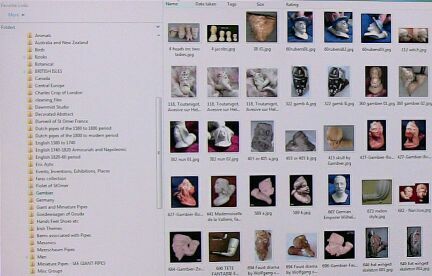 Heather Coleman is an artist, semi-professional archaeologist and clay pipe maker living in the county of Devonshire in England. she has collected and studied clay tobacco pipes on and off for over 35 years and her knowledge and enthusiasm are shared with you on this CD. Galleries of images of highly decorated French Figural pipes (including Gambier and Fiolet). Pipes by John Pollock & Co. Suitable for any PC equiped with CD-ROM drive and Web Browser. Post & Packing is INCLUDED on this CD. 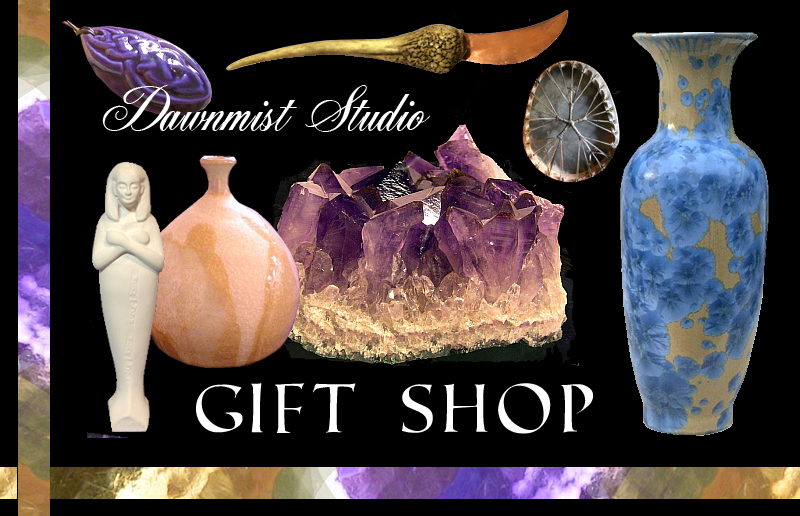 Visit the Dawnmist Studio Clay Pipe Hall of Fame! 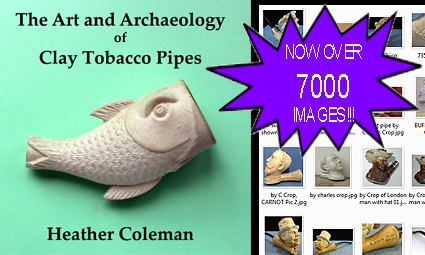 Please visit my other Clay Pipe sale page which covers older collectors' items as well as sometimes books when available!